With this sweeping reinterpretation of early cultural encounters between the English and American natives, Joyce E. Chaplin thoroughly alters our historical view of the origins of English presumptions of racial superiority, and of the role science and technology played in shaping these notions. 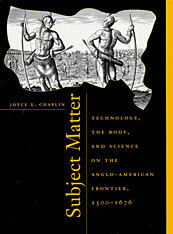 By placing the history of science and medicine at the very center of the story of early English colonization, Chaplin shows how contemporary European theories of nature and science dramatically influenced relations between the English and Indians within the formation of the British Empire. In Chaplin’s account of the earliest contacts, we find the English--impressed by the Indians’ way with food, tools, and iron--inclined to consider Indians as partners in the conquest and control of nature. Only when it came to the Indians’ bodies, so susceptible to disease, were the English confident in their superiority. Chaplin traces the way in which this tentative notion of racial inferiority hardened and expanded to include the Indians’ once admirable mental and technical capacities. Here we see how the English, beginning from a sense of bodily superiority, moved little by little toward the idea of their mastery over nature, America, and the Indians--and how this progression is inextricably linked to the impetus and rationale for empire.